Wes doesn’t have a costume this year. At least, not yet. 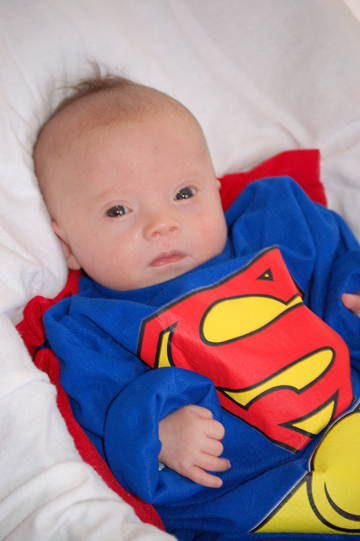 When he was born I got him a Superman costume off eBay, which was supposed to be for babies 0-9 months and which served him well for two Halloweens. Here he is 6 weeks old. I think he weighed about 5 lbs back then. 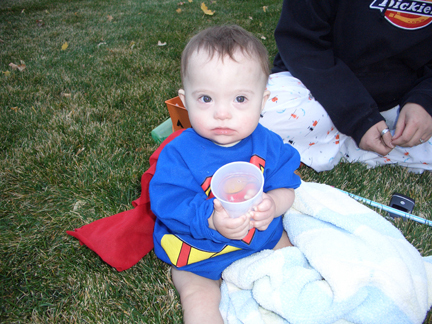 And here he is last Halloween, 13 months old. The ironic thing is that I normally despise dressing myself up for Halloween, but since I’m teaching Zumba at a Halloween fundraiser party I’ll be all decked out this year. Dressing up one person is enough work, but two? I have no ideas and really no ambitions to dress Wesley up. Unless you have some good, easy suggestions for me. Any? This is Hannah. it’s just easier to log on as Josh. Walmart has onesies for $3 that are pumpkins of skeletons. You could just buy him some orange or black pants to got with it and call it a costume. make that pumpkins OR skeletons. Jailbird – White sweat shirt and pants. Cut off hems. Add stripes using black duct tape. Just make sure it’s not stuck on too tight to make material pucker. Add jailbird number on front between stripes and “Department of Correction” on back. Clown – Baggy pants with rubber band at the ankles, colorful shirt (any size that works), spray paint hair different colors after you fluff it up with gel or hair spray, paint face like a clown. A Color – Any color sweat pants and shirt so long as they match. Paint face and hair the same color. If you want, you can put his color on front with tape. It doesn’t have to be the Crayola sign. Just simple. Franken-Toddler – Flannel shirt (leave cuffs unbuttoned), any pants (if they’re old, you can make the hems raggy and tattered), slick back hair with gel, color face green if you want, but at least use eyeliner to paint scars on the face…the kind with stitches in them. I also think spiked hair would work well. Greaser – White t-shirt with sleeves rolled up (pack of gum or breath fresheners rolled into sleeve is optional), blue jeans (rolled up), white socks showing, hair greased into pompador or some slick style.